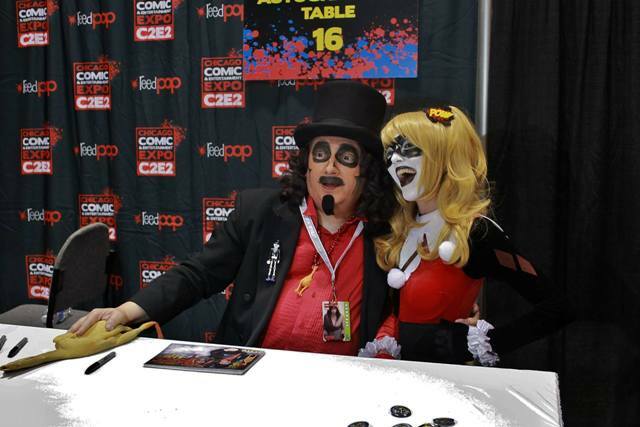 National TV horror host, Svengoolie, has never had any trouble attracting long lines at C2E2 (Chicago Comics & Entertainment Expo) and this year would be no exception. 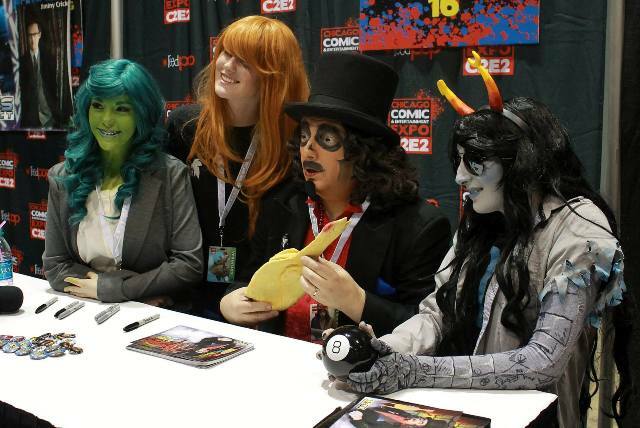 The only notable difference was the time of his appearance; earlier than previous years and conflicting with the photo op time tickets I had for Stan Lee. 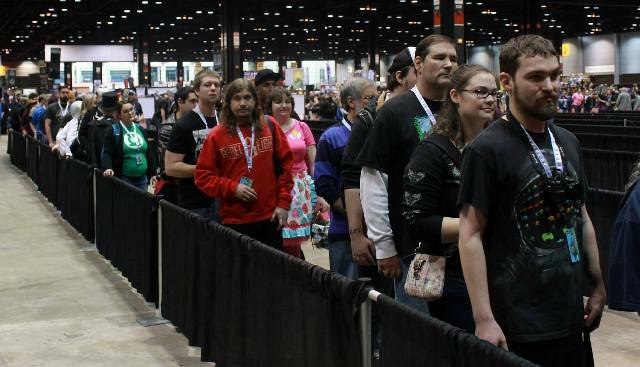 Fortunately C2E2 is a well-oiled machine and despite missing his arrival I was still able to get to him rather quickly…though hardly alone. 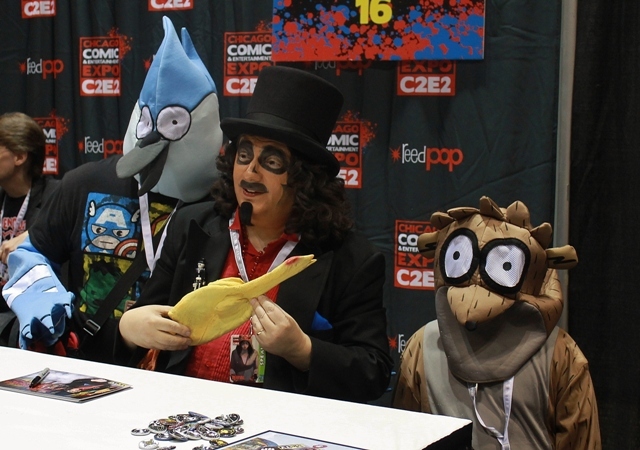 Svengoolie and his crew (Jim Roche, Chris Faulkner, and Aaron Covich) have been kind enough to let me hang near them during his signings, even though space is an issue. 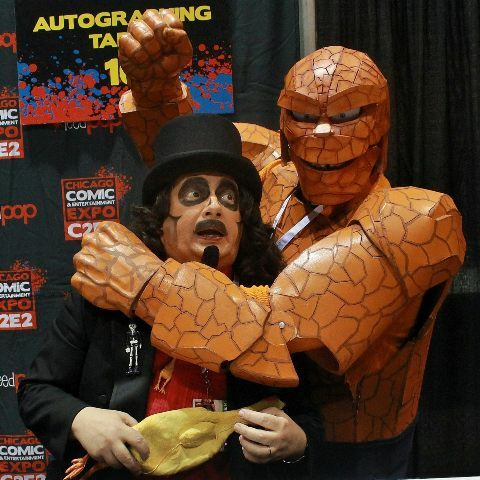 It can be a challenge trying to get good shots of him with costumed fans while not stepping on their toes. This year I thought I’d be clever and get to some of those fans first. I’d survey the line for the ones that stood out and then ask if they’d be willing to do a pose for this site after Jim took his picture. It seemed to work out great; we both got pictures different from one another until I was working with one of them and saying to Sven, “Keep your head forward but turn your eyes to the side and look horrified….no turn your eyes the other way.” After it was over, Sven says, “I love how you give me direction.” Doh! I don’t think he was irked, but clearly I was overstepping my role (though I can’t say I wasn’t happy with results). After the signing was over, Sven exited through the back curtain where he conducted an interview for a fan. I’m not sure if it was for a vlog or a podcast but, after a few minutes I started to get antsy as I noticed Joel had also gone behind the scenes and was afraid he’d leave and the opportunity would pass. 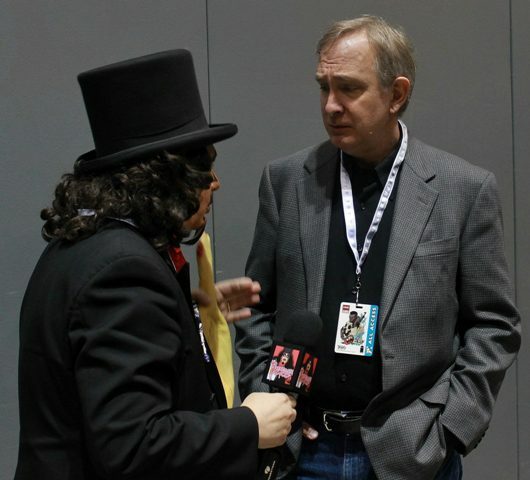 It turned out I had little to worry about as the Svengoolie team had already arranged an interview with Beaulieu who was now making his way towards us with Joel accompanying him. Soon I had them both in my peripheral vision as they gradually made their way to the center and met for the first time. 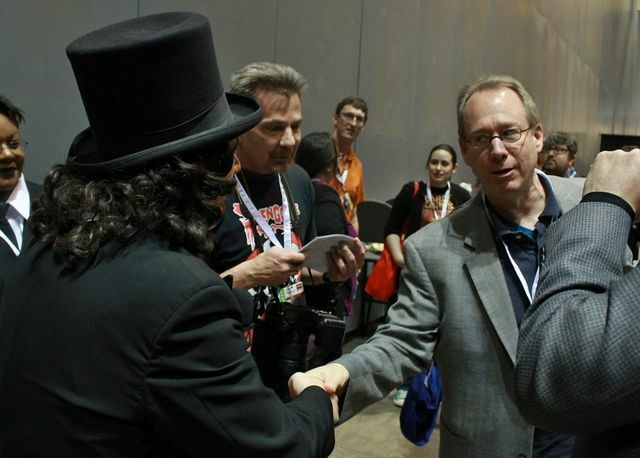 It was Joel who would extend the greeting; reaching out while addressing him by name, “Svengoolie!” he reached for his hand. “I’ve heard a LOT about you and I’m glad we could finally meet!” Sven expressed his pleasure in meeting the MST wizard as well. 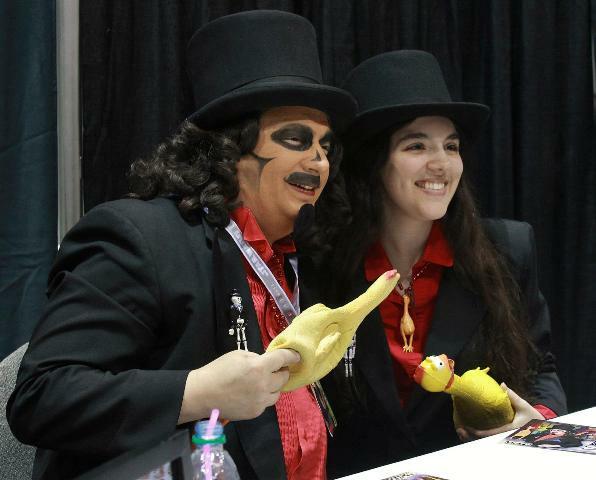 It was quick and before leaving Joel added, Lots of great buzz out there about Svengoolie!” I had hoped there would have been time for the two to formally pose for a photograph together but the moment was gone. I felt incredibly fortunate to have witnessed the occasion and that I caught it on film. Beaulieu, however, would stick around. 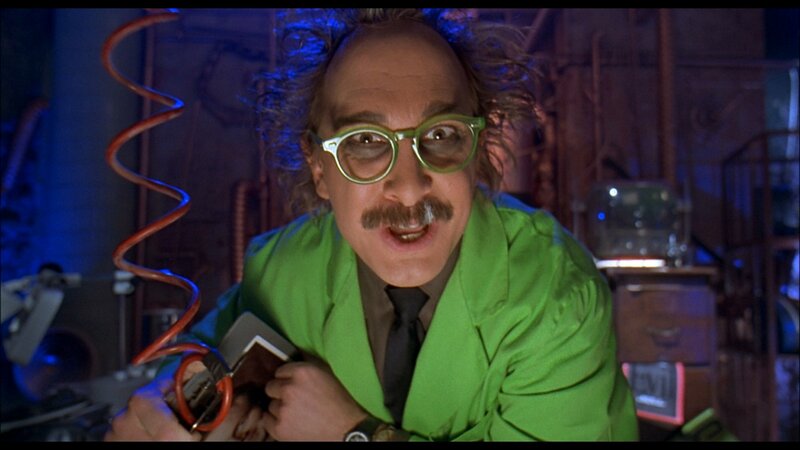 Having written for the iconic show as well as voicing Crow the Robot and playing the goofy mad scientist, Dr. Clayton Forrester he would be a major presence in the show’s first seven seasons. 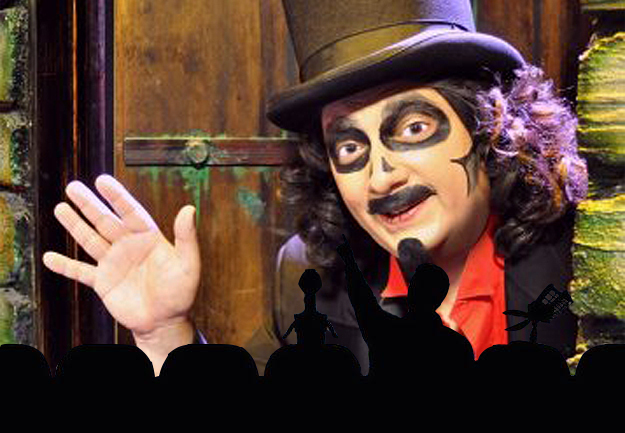 Svengoolie would interview him for his show which will hopefully be airing soon. I was standing back with Jim and didn’t get to hear much so I’m really looking forward to it. It sure was and Chicago is lucky to have him! 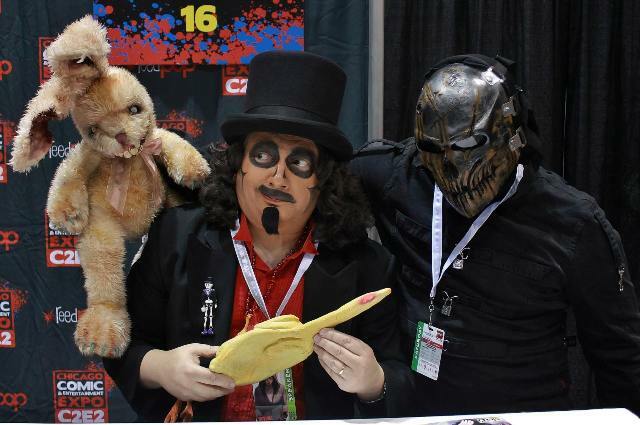 This entry was posted in Convention & Expos, Horror Hosts, Stalking Svengoolie! 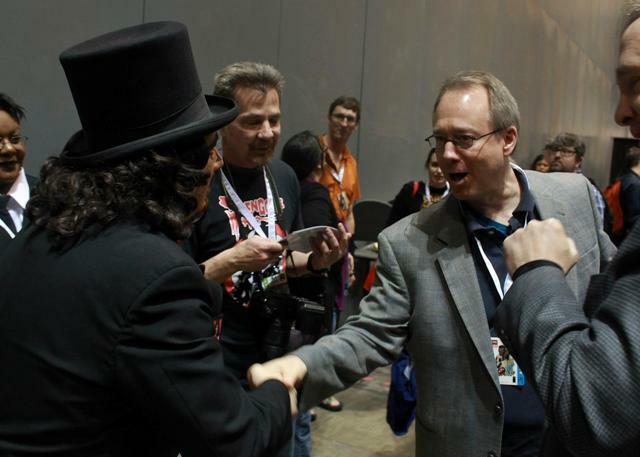 and tagged C2E2, Joel Hodgson, Mystery Science Theater 3000, Other Space, Svengoolie, Trace Beaulieu. Bookmark the permalink. ← The 2015 Hearse Show was quite a ride!